Starbucks lovers, this Caramel Macchiato recipe is for you! A perfect balance of coffee, milk, vanilla, and caramel, and it’s SO good. Whether you need to start your morning with a sweet treat, or you need an afternoon pick-me-up, this caramel macchiato recipe is right for you. No crazy tools or skills are required for this recipe, so even if you’re a complete beginner with limited tools you can make this coffee drink at home. What’s in a caramel macchiato? Starbucks caramel macchiato is made with espresso, steamed milk, their vanilla-flavored syrup, and caramel sauce. For regular coffee: Brew double strong coffee and set aside. If using k-cups, brew 1 k-cup at 4 oz cup setting. Microwave milk for 30 to 45 seconds (or heat it on the stove) and beat with a whisk until rich and foamy. To assemble the drink, place 1/2 tablespoon vanilla syrup and 2 tablespoons caramel sauce into the mug, pour in the milk and gently add 1/3 cup coffee. Drizzle with caramel sauce. Sweeten to taste. For espresso: Pour 6 ounces cold milk into the frothing pitcher and steam. Set aside. Pull out one double espresso shot. To assemble the drink: place 1/2 tablespoon vanilla syrup and 2 tablespoons caramel sauce into the mug. Add milk and then gently pour in espresso (do this slowly to keep the “mark” on top). Drizzle with caramel sauce and sweeten to taste. To make it skinny, use non-fat milk and sugar-free syrup. It’s so easy and delicious. 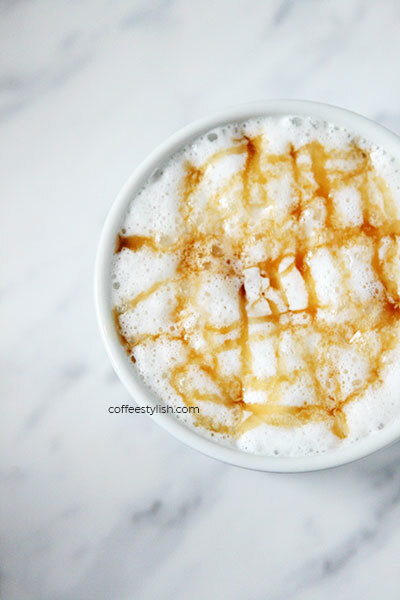 LIKE THIS CARAMEL MACCHIATO RECIPE? PIN IT! Hi Danijela. I tried this recipe, and it was a good and refreshing cup of coffee. I say refreshing because sweet coffee is not what I usually drink. To be honest, I think coffee should be bitter, and I like it so, but I am open to new experiences too. Anyway, I modified your recipe by sprinkling in organic coconut and raw cacao shreds. It made the drink even better. But perhaps I am biased- I adore coconut and every recipe that features it.